“Can I do yoga with you before bed, Mommy?” Sierra asked me last night with the sweetest inflection in her voice. How could I refuse that question? My new time for doing a home yoga practice is in the evening, after my daily responsibilities are done, children are in bed and the busyness dissipates, at least for a moment or two. Since dinner I had been thinking about doing a deeply meditative practice, a nice long pranayama (breathing exercise) and meditation. Then, in that moment, I looked at her eager eyes and saw a different practice before me. This one is full of sharing, connection and fun with my daughter. She wants to start with sun salutations. A little invigorating for the evening, I think to myself, but it’s ok and it will probably feel good. I watch her seven-year-old body move with grace and fluidity. She asks for help dropping back into urdhva dhanurasana, upward bow or wheel pose, and I admire the innate flexibility of youth. Her spine is so open! We do virabhadrasana, the warrior pose, and I see strength and confidence build in her body. I hope these qualities stay present when she is confronted with troublemakers at recess. Sierra then decides to flip through Yoga Journal magazine and do poses that strike her fancy. She wants to do them together, very complex postures. I try to silence the voice in my head that is dreaming up a sequence to properly prepare the body for each one—glad that teacher aspect is ingrained in me. But I let it go, enjoy the spontaneity and just hope I’m not too sore tomorrow! I end with a couple of my staple poses and a short shavasana, rest pose. She mirrors me. Then it’s time for sleep. I tuck her in bed and let her know that we can do that any time. She goes to bed with a huge smile across her face and I can feel the happiness in her heart. It’s in mine, too. I have spent many a’ time trying to do my own yoga practice with my children climbing on me, dancing and jumping around the room and me! This time, I went with what would be best for both of us, and it made all the difference. 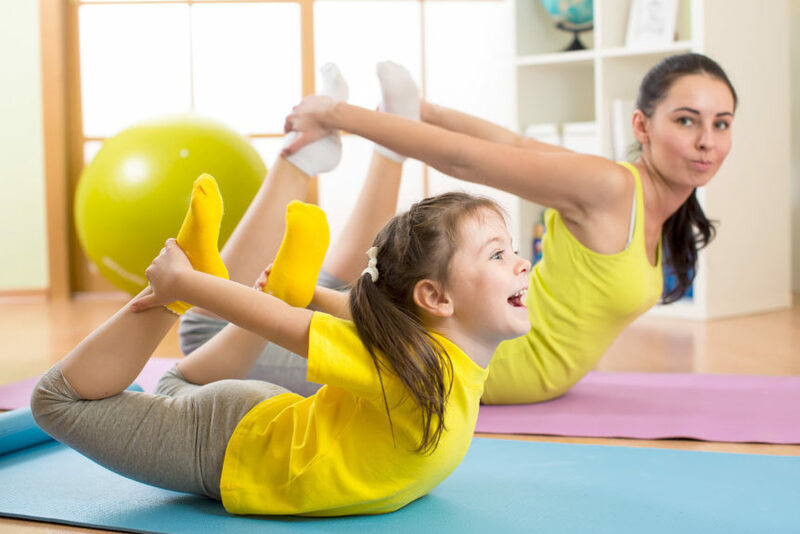 Do you practice yoga with your children? What works or doesn’t work for you? Anything to share? I’d love to hear!